In the old day, before Photoshop, photos were retouched by hand. Using fine brushes or airbrushed details were added or backgrounds deleted. 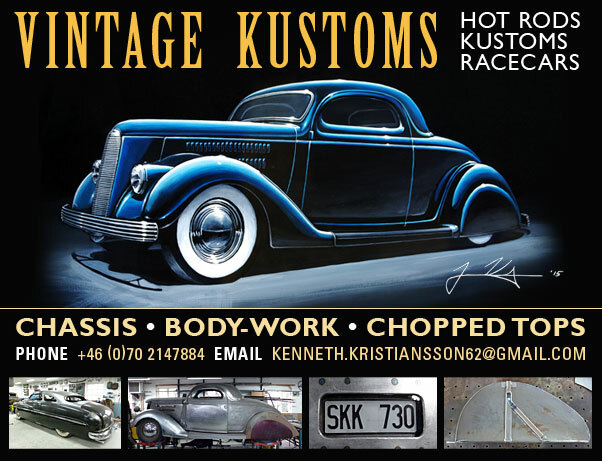 This photo of the Jesse Lopez 1941 Ford, used for a magazine print comes from the Barris Kustom Collection. It is a great sample that shows how photos were retouched, or prepped in any other way for magazine or book printing. Today, photos get retouched digitally, using Photoshop, or similar photo editing program on the computer. But before there were desk top computer this retouching was done all by hand. By skilled craftsman who used fine brushes with many shaded of gray, white and black to fine tune black and white photos. Often photos that were going to be used in magazine or book printing had to be enhanced in a way to make sure the image looked the best in print form. 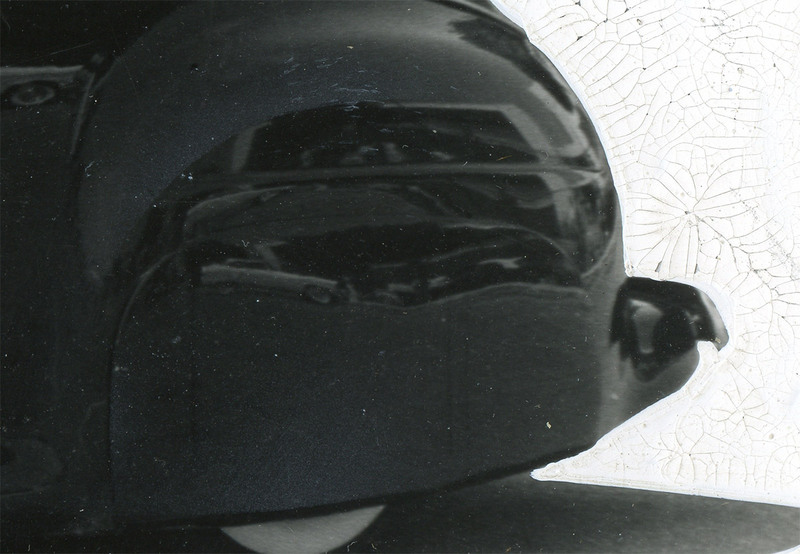 Printing techniques were not as high-tech and detailed as they are today, resulting in that photos needed to have a higher contrast to begin with to make sure the end result would not turn out as a black blob in case of black and white printing. This photo of the Jesse Lopez 1941 Ford, which was actually owned by Danny Lares when this photo was taken is a wonderful sample. It shows how photos had the back ground removed, to high light just the subject car. The background was “simply” painted white with water thinned paint. Water thinned paint was used to ensure the photo could go back to original simply by rinsing it in water. Photo from the Barris Collection with the hand painted white background still in place. 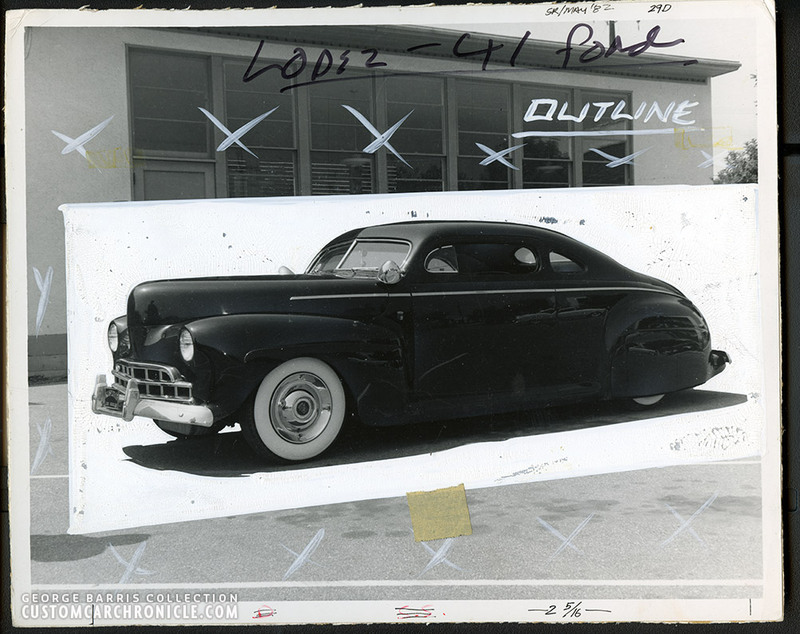 This ’41 Ford sample photo shows how the background was “taken out” with the white paint, and also shows how some of the details were slightly enhanced using subtile lighter color fades added using an airbrush. 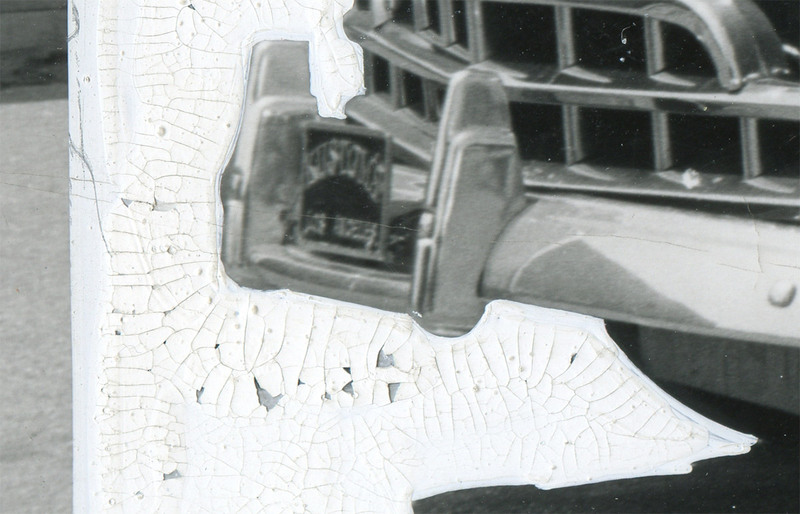 Details like this made sure there would still be some details left after the printing process, especially important with dark painted cars like the Lopez Ford which was dark green, but appeared more like black in every black and white photo. Techniques like this were developed in the early 1900’s, and continued to be used until the Computer made its entry in the graphic world in the mid 1980’s. This particular photo has several markings which makes it hard to figure out when the retouch and background removal actually happened. The photo clearly is old, and looks to be from the mid 1950’s. But on the top right it can be read that the photo was planned to be used in Street Rodder magazine from May 1982. 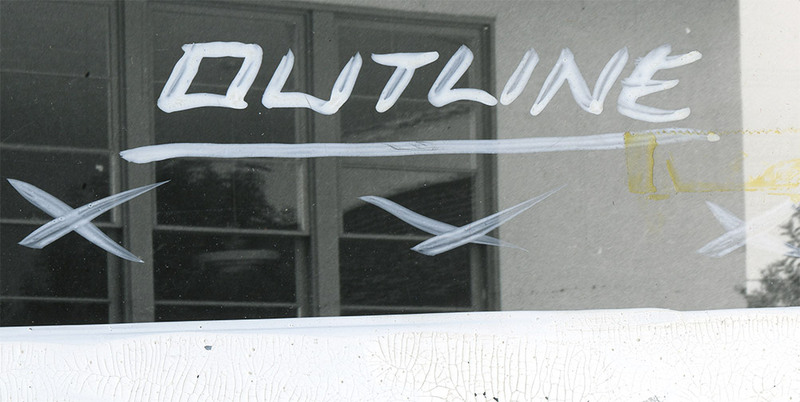 The “Outline” lettering looks like it dates back to the 1950’s. 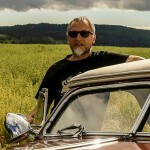 So possibly the photo was used with the car set free from the back ground several times. Outline was written down as instructed by the art-director, to make sure the prep people at the print shop would know what to do with the photo. 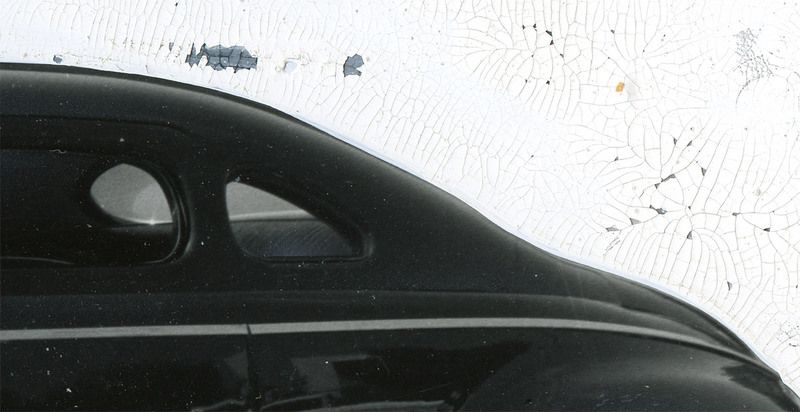 Close up details shows that the Sam Barris chopped rear quarters were not followed exactly by the artist who applied the white paint. But, in his, or her defense, making these brush strokes with the back ground of the photo still visible is not easy. 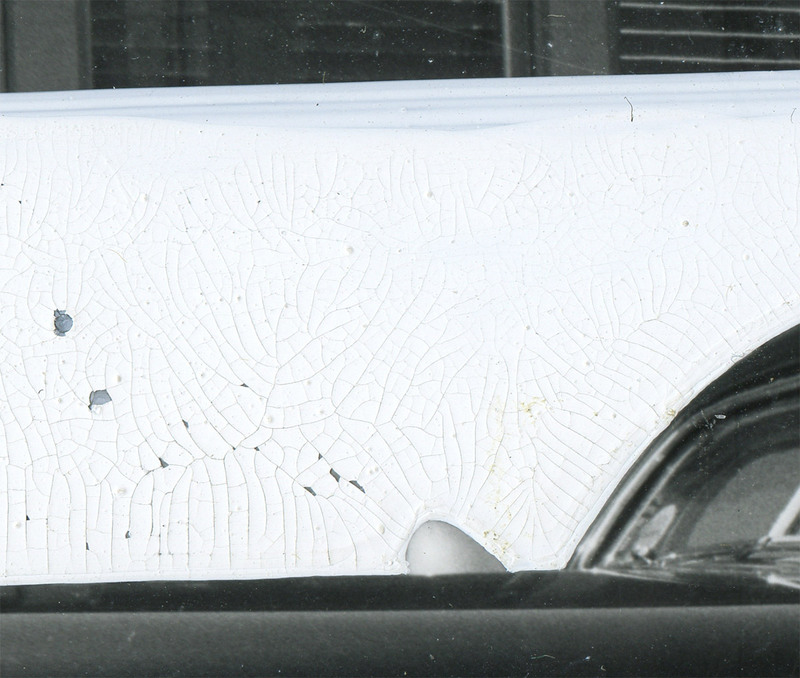 Over time the water diluted white paint dried up to where it started to crack. making it look really beautiful. The details of the outlining are far from perfect when you look at it close up, but ones the photo was prepped for reproduction and printing plates in the rather course grid were created it all looked just fine. 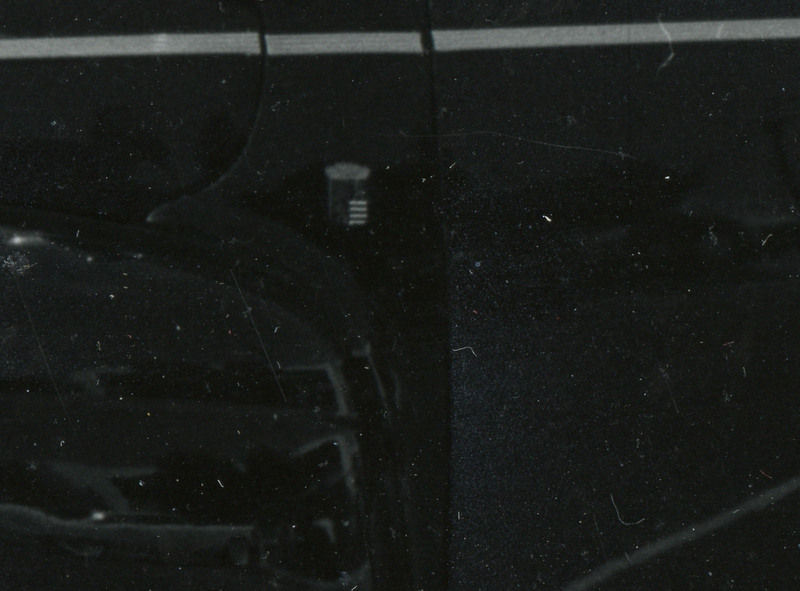 The rear fender shows some added highlight fading at the top, and at the lower section on the fender skirt. 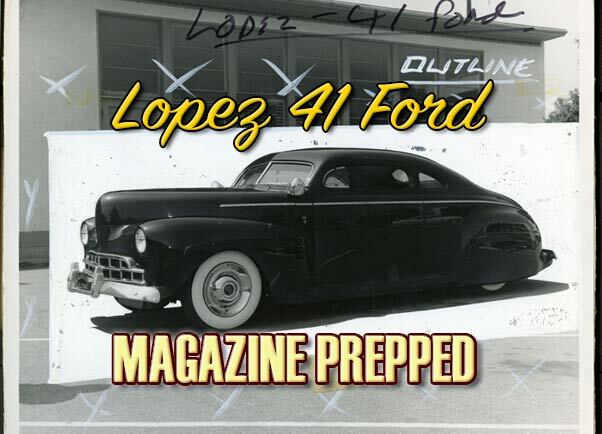 I have not been able to find the actual magazine printed version of this set free Jesse Lopez / Danny Lares ’41 Ford, there is one similar that was used in several early publications, but that shows the car with the short hood trim, no Barris crest and single bar flipper hubcaps. The is the only similar, but different photo of the Jesse Lopez Ford I could find that had been set free from the background. It is however a good sample to show how the end result looked like. This one was used in the Dan Post Blue book of Custom Restyling. Thank you for the trip down memory lane Rik. As one who started in the very early 70s and made the early transition to computers I am familiar with both techniques. I sometimes miss the old ways but will never give up my Photoshop now! Pretty cool that the artist’s photo still exists in it (re)touched form! Another window in the way things were done in the early days of customs and print media. All that went out the window when computers came in…killed of a lot of people’s jobs, not to mention skills. I miss those days.